Ήταν μωαμεθανός στο θρήσκευμα και υπηρετούσε στην Κωνσταντινούπολη σαν γραφέας του "δευτεράρη", επικαλούμενος Πατσουρούνης. Στο σπίτι του είχε σαν υπηρέτρια κάποια χριστιανή Ρωσίδα, στην οποία επέτρεπε να τελεί ελεύθερα τα θρησκευτικά της καθήκοντα στους ναούς. Ό ίδιος βαπτίσθηκε κρυφά και έγινε χριστιανός. Σε κάποια επίσημη συζήτηση, πού έγινε με μορφωμένους μωαμεθανούς, ισχυρίστηκε ότι ή μόνη αληθινή θρησκεία είναι ή Χριστιανική και ομολόγησε την πίστη του στον Χριστό. Τότε καταγγέλθηκε στις τούρκικες αρχές, συνελήφθη και απαγχονίστηκε στις 3 Μαΐου 1682 στο Κεάτχανε Μπαξέ της Κων/πολης. Το μαρτύριο του συνέγραψε ό Ί. Καρυοφύλλης. Στο Μικρό Ευχολόγιο, στον Συναξαριστή του Αγίου Νικόδημου και στο Αγιολόγιο του Σ. Εύστρατιάδη, ή μνήμη του Αγίου αυτού αναφέρεται την 24η Δεκεμβρίου. The holy New Martyr Ahmed was born in the seventeenth century to a Muslim family in Constantinople. By profession he was a copyist in the Great Archives. In accordance with Ottoman law, since he did not have a wife, he had a slave instead, a Russian woman. Another captive from Russia lived together with her, an old woman, also a slave. Both these women were very pious. On feast days the old woman would go to church. Taking the blessed bread or antidoron, she would give it to the young woman to eat. The old woman would also bring her holy water to drink. Whenever this occurred and Ahmed was close to her, he would smell a beautiful and indescribable fragrance coming out of her mouth. He would ask her what she was eating to make her mouth smell so fragrant. Not realizing what was happening, the slave would say that she was not eating anything. However, he persisted in asking. Eventually she told him that she was eating the bread which had been blessed by the priests, which the old woman brought her whenever she returned from church. On hearing this, Ahmed was filled with longing to see the Orthodox church and how Orthodox received this blessed bread. Therefore he summoned a priest and told him to prepare a secret place for him, so that he could go when the Patriarch was serving the Liturgy. When the appointed day arrived, dressed as an Orthodox, he went to the Patriarchate and followed the Divine Liturgy. While he was in church, he saw the Patriarch shining with light and lifted off the floor, as he came out of the altar and through the holy doors to bless the people. As he blessed, rays of light came from his finger tips, but though the rays fell on the heads of all the Orthodox, they did not fall on Ahmed's head. This happened two or three times and each time Ahmed saw the same thing. Thus, Ahmed came to the faith. Without hesitation he sent for the priest, who gave him rebirth through baptism. Ahmed remained a secret Orthodox for some time, concealing his baptismal name, which is why it has not come down to us. However, one day Ahmed and certain noblemen were eating together. Afterwards they sat talking and smoking, as is the Muslim custom. In the course of the conversation they began to discuss what the greatest thing in the world. Each gave his opinion. The first guest said that the greatest thing in the world was for a man to have wisdom. The second maintained that woman was the greatest thing in the world. And yet a third said that the greatest thing in the world, and by far the most delightful, was good food - for was this not the food of the righteous in paradise? Then it was Ahmed's turn. They all turned to him, asking him for his opinion on this matter. Filled with holy zeal, Ahmed cried out that the greatest thing of all was the Faith of the Orthodox. And confessing himself to be a Christian, he boldly censured the falseness and deception of the Muslims. At first, on hearing this the Muslims were aghast. Then, filled with unspeakable rage, they fell on the holy martyr and dragged him to a judge, so that he could be sentenced to death. He was beheaded, receiving the crown of martyrdom on the orders of the ruler on 3 May 1682. 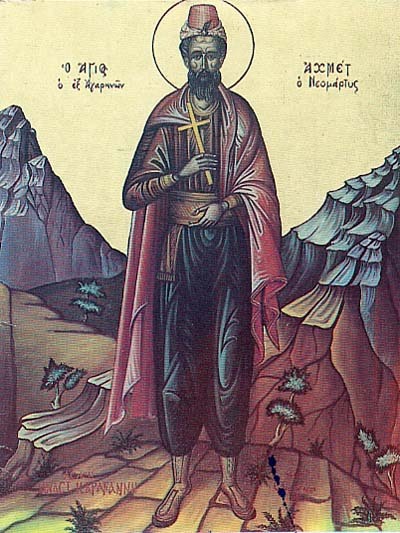 Holy Martyr Ahmed, pray to God for us!